Each Christmas I like to make truffles as one of my Christmas Eve treats. And though my brother assures me that nothing will ever top the classic Oreo Truffles (it’s true, they are the best), it doesn’t stop me from trying at least one new truffle recipe each Christmas! These truffles came about by necessity, but are now one of my favorites. I had half a block of cream cheese hanging around my fridge needing to be used. So I dug through the pantry and came up with these truffles! The center of the truffle is silky smooth and chocolaty with just a hint of peppermint. Who knows, maybe this will be a contender for the new favorite truffle! Melt the 4 oz chocolate in a double boiler or microwave. Add the Candy Cane Kisses and stir until smooth, returning to the heat as needed. Add the softened cream cheese and peppermint extract and stir until very smooth. Cover the dish and place in the refrigerator until firm, about 1 hour. Once firm, use a small scoop (approximately 1 tablespoon) to scoop the filling, rolling it between your palms to form a nice round ball. Place the balls on a cookie sheet lined with waxed paper and place in the refrigerator for 15-20 minutes. Meanwhile, melt the remaining 2 oz semi sweet chocolate and extra dark chocolate, stirring until very smooth. One by one, dip the truffles into the melted chocolate, placing back onto the lined cookie sheet to harden. Add sprinkles while the chocolate is still wet, if desired. Refrigerate the truffles until the chocolate is hardened. Then move the truffles to an airtight container. Store in the refrigerator until ready to serve. 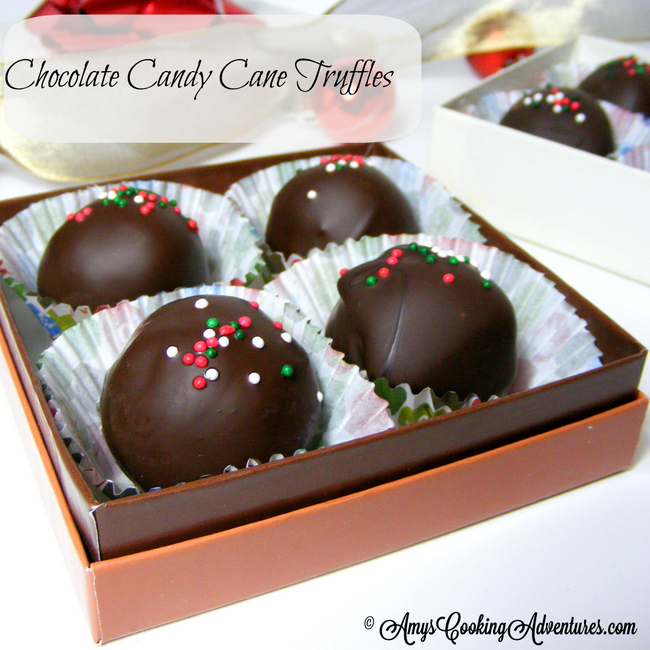 These truffles look absolutely velvety and wonderful in the center and totally delicious! These are SO PERFECT for the holidays!! These look awesome! And, definitely worthy of gift giving! Thanks for sharing at Must Try Monday! Those look so yummy... I could almost eat the picture! Mmm, chocolate and peppermint, two of my favorite things! Yum!!!!! These look and sound amazing!!! Ooh wow, those look great! Thanks for sharing at The Fun In Functional! Mmmmm!!!!!! These look awesome! Pinning!